Tell me that's not meat! 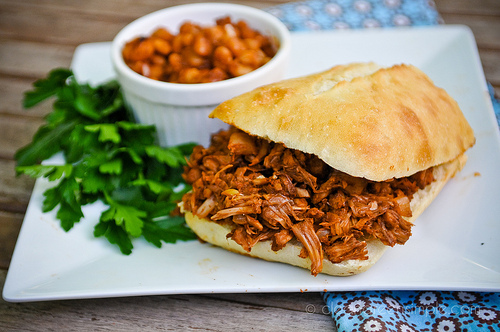 Jessica's Carolina-spiced pulled "pork" sandwiches are a must - using a mysterious Asian fruit - that look and taste pretty much like the real deal! Living either gluten free or vegan is a challenge at best, but trying to live both diets can be downright frustrating, especially when it comes to get-togethers or, really, eating outside the house. Whether this is a lifestyle you have chosen or something that was kind of flung into your lap, here are a few great recipes to get ready for Memorial Day, the kick-off for picnic and barbecue season! Carolina Pulled "Pork" Sandwich Seen above, 100% vegan and also soy-free! This sandwich features the incredible edible... jackfruit? Creamy Dill Potato Salad What says "picnic!" like potato salad? This summer staple hits the mark, with tons of add-in options. Zucchini "Pasta" Salad with Creamy Lemon Herb Dressing Both light and filling, this faux-pasta salad is a super healthy alternative to macaroni or rotini and pretty tasty, too! Ethiopian Curried Lentils For a more ethnic option: chock-full of protein-rich lentils and veggies, this curry is super simple and is excellent served hot or cold. Strawberry Cupcakes Celebrate strawberry season with these gorgeous dairy free and vegan cupcakes with Strawberry Frosting. Chai Coconut Crispy Rice Bars Like a cross between a Rice Krispie Treat (marshmallow bar) and a sesame seed bar, these vegan snackbars are mighty delicious and full of whole grains!